Author Rich Silver and Jen Arkin. Photo: Martin Griff. Adaptive skiing and snowboarding programs serve adults and children across North America and throughout the world. For more information and adaptive sports programs listed by state, visit Disabled Sports USA. We hopped off the chair lift on what was another beautiful Colorado ski day. Heading down the mountain in front of me was my ski companion, Aspen/Snowmass local, Jen Arkin and her ski buddy, Deb. As I I followed down the groomed slope, watching them navigate the trail ahead, I realized that this day on the mountain was going to be different. Jen waited for me to catch up. “I love to ski moguls, how about you?” she said, proceeding to fearlessly navigate the bumps below. I watched her in amazement and when I caught up, she was grinning from ear to ear. Jen Arkin (center), her Challenge Aspen ski buddy Deb (left) and post author Rich Silver. Jen has Cerebral Palsy and decided years ago that her disability was not going to stop her from enjoying the exhilaration of the activity she loves so much. On the chairlift ride back up the mountain Jen proudly exclaimed “I can actually ski better than I walk,” and proved it by leading me down a black diamond trail. Her contagious smile and upbeat attitude were nothing short of inspiring as we spent the morning sharing our love of the mountains. Skiers often speak about their “best days on the hill” — this was surely one of mine. Jen is one of thousands of folks who participate in adaptive programs on ski mountains across America. Challenge Aspen, in partnership with the Aspen Snowmass Ski Company, provides those with special needs discounted private lessons from specially trained PSIA instructors, buddy support by trained assistants and volunteers, and all types of adaptive equipment necessary to participate in on-snow activities. Remarkably, this includes the visually impaired, who courageously navigate the hill through voice commands and deep trust in their guide. Hauser emphasizes that this is not just a ski program. Summer retreats offer groups from around the world the opportunity to sign up for fly fishing, archery and camping. In addition, Challenge Aspen Military Opportunities or ‘CAMO’ is specifically designed for injured veterans, offering full financial aid to those suffering from PTSD and traumatic brain injuries. Challenge Aspen is dedicated to changing the lives of its participants and rebuilding their confidence. If you or someone you know has physical or cognitive challenges and would like to enjoy all of the outdoor activities the mountains have to offer; or if you’d like to donate or get involved as a volunteer, contact Challenge Aspen at 970-923-0578 or via the website link above. You might be lucky enough to run into my new friend Jen, with whom I look forward to skiing for many seasons to come. 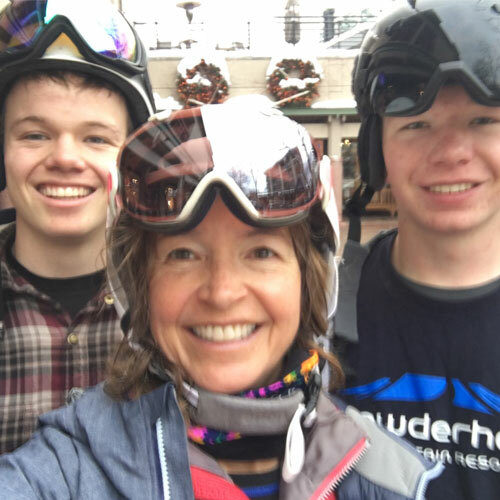 He’s an avid skier, deeply committed dad and good friend and ski buddy to The Brave Ski Mom. Kristen, thanks for posting this. Challenge Aspen and all of the adaptive ski programs do such incredible work with handicapped folks. The joy we all feel out on the hill is something very special and how wonderful that EVERYONE, regardless of their disability, can experience it. And CONGRATULATIONS to Jen Arkin, who we just found out won a skiing GOLD MEDAL at The Special Olympics last week in Squaw Valley. 🙂 —How about that? Proof positive and pure joy ! This is fantastic! Thank you for sharing Jen’s results!